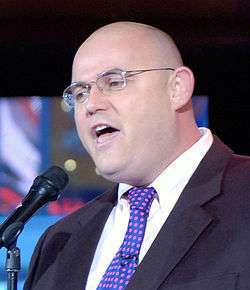 Ronan Tynan (born 14 May 1960) is an Irish tenor singer. He is most notable as a member of The Irish Tenors re-joining in 2011 while continuing to pursue his solo career since May 2004. In the United States, audiences have come to know and appreciate him for his involvement with that vocal group and for his renditions of "God Bless America." He is also known for participating in the 1984 and 1988 Summer Paralympics. Tynan was born in Dublin, Ireland. His family home is in Johnstown, County Kilkenny, Ireland. He was born with phocomelia, causing both of his lower legs to be underdeveloped; his legs were unusually short (he is now 6-foot 4), his feet were splayed outward, and he had three toes on each foot. :16 He was one of a set of twins, but his twin brother Edmond died at 11 months old. :18 At age 20, he had his legs amputated below the knee, after a back injury from a car accident; the injury to his back made it impossible for him to continue using prosthetic legs without the amputation. :84 Within weeks of the accident, he was climbing stairs at his college dormitory on artificial legs. Within a year, Tynan was winning in the international competitions in track and field athletics. He represented Ireland in the 1984 and 1988 Summer Paralympics, winning a total of four golds, two silvers, and one bronze medal. Between 1981 and 1984, he won 18 gold medals from various competitions and set 14 world records. In the following years, Tynan became the first person with a disability to be admitted to the National College of Physical Education, in Limerick. He worked for about two years in the prosthetics industry, then went on to Trinity College, became a physician specialising in Orthopedic Sports Injuries, and graduated in 1993. Tynan has often sung "God Bless America" at various sporting event venues, such as Yankee Stadium (during New York Yankees home Major League Baseball games, including Opening Day, nationally-televised games, the last game at the old Yankee Stadium, and playoff games) and on several occasions prior to games involving the National Hockey League's Buffalo Sabres including a performance before 71,217 fans at the AMP Energy NHL Winter Classic along with Sabres anthem singer Doug Allen, who performed the Canadian national anthem, on 1 January 2008, when the Sabres played the Pittsburgh Penguins. Although Tynan has not performed for the Sabres since Terrence Pegula purchased the team in 2011, his renditions have always been well received and appreciated by those in attendance. In 2004 he sang "New York City" at Belmont Stakes and less than a week later he was at the Washington National Cathedral for former United States President Ronald Reagan's state funeral, where he sang "Amazing Grace" and Franz Schubert's "Ave Maria". While real estate agent and prospective buyer Dr. Gabrielle Gold-von Simson was looking at an apartment in Tynan's building on Manhattan's East Side, Tynan made what was construed to be an anti-Semitic remark. Shortly after this, the Yankees cancelled Tynan's performance of "God Bless America" for Game 1 of the 2009 American League Championship Series on 16 October 2009 because of the incident. According to Tynan's version of the event, two Jewish women came to view an apartment in his building. Some time afterwards, another estate agent showed up with a potential client. The agent joked to Tynan "at least they're not (Boston) Red Sox fans". "As long as they're not Jewish," Tynan replied, referring to the exacting women he had met earlier. The prospective client, Jewish paediatrician Dr. Gabrielle Gold-Von Simson, took umbrage and said: "Why would you say that?" Tynan replied: "That would be scary", and laughed, referring to the previous incident. Tynan subsequently apologised for his remark. The Anti-Defamation League accepted his apology. Tynan performed at an ADL event in Manhattan soon thereafter. ↑ Knox, John (2010). Tynan still hurt over the leaving of New York. 1 2 3 Tynan, Ronan (2002). Halfway Home, My Life 'Til Now. ↑ "Ronan Tynan". cbn.com. Retrieved 23 April 2016. 1 2 "Irish Tenor Ronan Tynan to Keynote Providence Mount St. Vincent Legacy Luncheon". theopenpress.com. Retrieved 23 April 2016. 1 2 "Ronan Tynan's Identity Crisis on Display at The Calvin". masslive.com. Retrieved 23 April 2016. 1 2 "EXCLUSIVE: Yanks Bench Tenor After Jewish "Joke"". NBC New York. Retrieved 23 April 2016. ↑ "Winter Classic: We're live from Buffalo". ESPN.com. Retrieved 23 April 2016. 1 2 http://www.nypost.com/p/news/local/tenor_booted_from_yankees_game_after_NmiZdYsI7VFwNBCZA8QxwI "Tenor Booted from Yankees Game After Anti-Semitic Slur"], New York Post, 16 October 2009, p. 7. ↑ Kevin Cullen (14 March 2010). "Scorned by New York, tenor regains a voice". The Boston Globe. Retrieved 6 October 2014.